On or off stage, certain Christmas customs involve proto-theatrical dances. The panuluyan (the Holy Family seeking lodging in Bethlehem) and the pastores (shepherds singing and dancing from house to house) are annual enactment. Today, ritual dances that follow in January, like the sinulog in Cebu and the dinagyang in Iloilo are dressed-up spectacles in the streets. In surviving comedia (also called moro-moro, a play about the conflict between Christians and Moslems), the battalla (choreographed skirmish) is set off as a feature. With further Westernization, the Spanish zarzuela and the American vaudeville (later called stage-show) displayed dancing as much as plot and song. These forms were later on displaced by musical comedy with its full production number of song and dance. Ballet as classical form, with its codified technique that started in Italy and France under royal patronage, came to the Philippines at the turn of the century. A composite of choreography, music, story and designs (set, costume, lighting), the ballet was acknowledged as a full form in 1581 with Ballet Comique de la Reine. As compositional presentation during the Spanish time, Maestro Appiani's shows could be considered ballets. Billed as ballet from 1901 onwards were shows by "infantile companies" of visitors and the formal productions of Baroufski Imperial Russian Circus. In 1915 and 1916, Paul Nijinsky danced costumed by Leon Bakst, Serge Daghilev's designer. In 1922, Anna Pavlova came in one of her global tours. In 1927, her dancer, Lubov "Luva" Adameit, established the most important school to solidify ballet teaching. Its technique is now recognized in various schools or styles in Europe, Russia and America. A Philippine syllabus was started in 1998. Ballet productions integrate the display of dancers' skill and interpretation, musical composition, scenery costume and lighting designs, and a story or abstract configuration of movements alone. Story-ballets are exemplified in the works of Leonor Orosa Goquingco, Anita Kane, Rosalia Merino Santos, and abstract-ballets of Remedios de Oteyza and some of Ricardo and Roberta Cassell. Those following them choreographed in any or both of these modes: Eddie Elejar, Felicias "Tita" Layag Radaic, Julie Borromeo, Tony Llacer, El Gabriel, Basilio (Steve Villaruz), Luis Layag, Tony Fabella, Gener Caringal, Eric Cruz, Nonoy Froilan, Edna Vida, etc. Several took on native themes, motifs and movements to wed with ballet's basically Western aesthetics. These are seen in the repertoire of Ballet Philippines, Philippine Ballet Theater and Ballet Manila today. Modern dance rose against the strictures of stultified ballet technique and presentation. Reformers were Loie Fuller, Isadora Duncan, Mary Wigman, Ruth St. Denis, Ted Shawn, Martha Graham, Doris Humprey, Charles Weidman, Hanya Holm, Jose Limon, Merce Cunningham, etc. Some of them visited Manila, while others spread their influence through Filipinos studying in Europe and United States. At the turn of the century, Ada Delroy showed Manila a development of Fuller' skirt-dance spectacle. Others rendered "orientalia" typified by Maude Allan and St. Denis. The 1926 visit of Denishawn company led to more established training and presentation. Kaethe Hauser and Trudl Dubsky (Zipper) introduced Europe's ausdrukstanz. Apprenticing with them were Manolo Rosado, Corazon Generoso Inigo, Rosalia Merino Santos, etc. More significantly Alice Reyes, a student of Holm, gave modern dance a solid base at the new Cultural Center of the Philippines in 1970. Today her company is Ballet Philippines with a classical ballet and modern dance repertoire. Following her are choreographers Denisa Reyes, Agnes Locsin, Jojo Lucila, Brando Miranda, Manuel Molina, Alden Lugnasin, Jes de Paz, Flordeliza Fernandez, etc. In production, modern dance follows ballet's integration of dance, music, designs, story or abstraction. Later it modified this nature with freer use of space and accompaniment, a symmetrical juxtaposition of shapes, improvisationary compositional means, even negation of spectacle, rejection of the proscenium setting, etc. Modern dance also lends to the integration of folk dance dynamics and ethnicity, exemplified in the works of Alice and Denisa Reyes, Locsin, etc. Jazz dance also takes theatrical form in concert presentation, musical comedy production an on television. Noted exponents are Julie and Rose Borromeo, Douglas Nierras and a number of TV choreographers. For a time, tap dance and Spanish dance (flamenco, etc.) were popular theatrical presentations, exemplified by Bayani Casimiro (tap) and Ruben Nieto (Spanish). 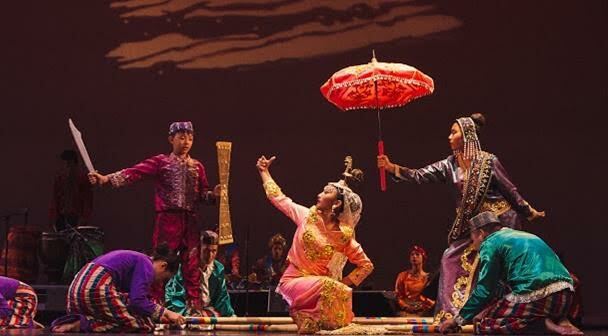 In a manner, today's folk dance presentation is theatricalized by stylizing the material, staging the patterns, stringing the dances into suites or binding them to a story or legend, and arranging the accompaniment. Basilio Esteban S. Villaruz is a former English instructor at the University of the Philippines who danced with Modern Dance Company (now Ballet Philippines), Hariraya Ballet Company, involving himself much later with Dance Theater Philippines as its balletmaster, choreographer and then artistic director. His recent choreographic works include: "Ritual Bonds", "Oriental Fantasy", "Ay Kalisud" (1990); and "Spiritual Canticle: An Eclogue-Operatorio" (1991). He is the Artistic Director of the University of the Philippines Dance Company.